Saggezza e Tradizione show you a culinary speciality typical of Sardinia, “Culurgiones” (culurxionis or culingionis). 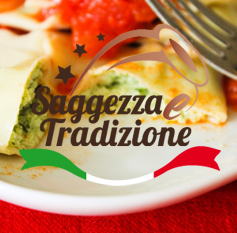 This gastronomic excellence completely hand-made and which is selected by “Saggezza e Tradizione”, was originally born in Ogliastra for being then spread quickly in the whole region thanks to its particular taste which is immediately loved by everyone wants to try it. Till the sixties the tradition wanted Culurgiones were eaten exclusively during the All Souls’ Day, while today they are eaten everyday because they are considered irresistible to food lovers. The oblong half-moon shape, due to the closing of the edges obtained pinching, is a process which gives to the product the particular shape of a spike. This typical shape is obtained closing a smooth pastry disk made of durum wheat flour, pressed in thin puff pastries with a diameter of 6/7 centimetres, around a filled heart, big as a nut. Its taste is delicate and balanced and the cooking is very fast, infact it takes just 5/6 minutes in salty water. Thanks to the durum wheat flour used for their pastry, Culurgiones keep their integrity also a lot of time after the cooking, remaining al dente. As the best chefs know, Culurgiones can be dressed in different ways: traditionalists eat them as plain food, some others eat them with a simple tomato sauce and some others with butter and sage. Given its particular shape, you can put three or five Culurgiones on a dish and you can obtain a big spike or on a round dish, you can obtain a shape similar to a flower. For eventual seconds requested by the tablemates, the tradition of serving them always in odd numbers must be respected. This kind of cake is a product par excellence of the Sardinian tradition and its origins are very ancient. Nowadays we can find it in every season while in past time it was possible to eat it during Easter celebrations.“Sebada” has been considered the gastronomic heaven in the world for long time. “Saggezza e Tradizione” selected this unique delicacy which was born into the Sardinian backcountry characterized by the Sardinian pastoral traditions. Infact this cake seems to be creted by shepherds’ wifes who wanted to thank their husbands works in transhumance so the origins of this cake are in the mountainous areas of Barbagia. “Sebada” can be described as a kind of big round ravioli pasta which is filled of fresh cheese, flavoured of lemon and fried. Generally in restaurants is served with orange or corbutus honey. Corbutus can be considered the most typical plant of Sardinia. The semi-transparent aspect of honey inspired the name of the processing. Infact its name comes from the Sardinian term “seu”, that specifies the brilliance in Sardinian dialect. Once honey is put on them these cakes become of golden colour and brilliant. 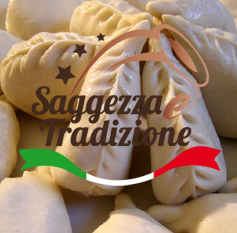 “Saggezza e Tradizione” selected a type of “sebada” of classical recipe which has its origins in ancient traditions. This is a very simple-tastes cake, like the Sardinian food tradition which is simple and natural and which is a special link between sweet and salted flavours. It’s improbable that who was in Sardinia, forgot the unique taste of Ravioli pasta and Sardinian small Gnocchi, which together with Culurgiones, are doubtless the typical dishes of the island. Like all the myths, also its majesty the Ravioli, was a point of reference for fantasy from its beginning. There are a lot of regions considered the native land of this kind of pasta, but there are not historical reports so it’s difficult to determine in which place and when the ravioli were born. We recognize that the ravioli as filled pasta, were born in the kitchens of the regal courts in medieval period and today as in those times they have an important place in our Italian tradition. 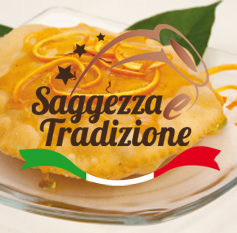 “Saggezza e Tradizione” selected for you the best Sardinian Ravioli, which have reached a quality level that put them among the best gastronomic products of the culinary Italian art. All this is due to the kind of land, that offers medical and aromatic herbs that spontaneously grow in the whole Sardinia. In addition the inner zone which is based on agro-pastoral economy, goes on in this way still today producing typical and unique products, with the authentic tastes of an ancient time, thanks to the natural products easily findable in the production. They have a delicate and balanced taste. The cooking is very fast, it’s needed to cook them in salty water for 5/6 minutes. Thanks to the wheat flour of the puff pastry, ravioli keep their integrity for long time after the cooking, being always al dente. The Sardinian Ravioli “Saggezza e Tradizione” selected for you, are handmade with traditional method and with high quality ingredients which are controlled, certified and very fresh.